Removal of surface grime, black encrustations, surface and sub-surface salts (efflorescence and sub-florescence), and geological growth. Cracks over ¼” in width where the unit has not completely fractured and is still securely anchored to the structure. Fine cracks typically only surface and under ¼” in width. Complete crack through the unit requiring removal, rejoining of the segments, and surface repair at the crack site, and then resetting in new bedding mortar. Chemical stripping of non-original surface coatings. Custom patching of missing or spalled areas. Patching of the missing area is then carved to match the original detail. The patch is then finished with custom matched glaze. Custom colored dispersed lime injection is utilized to repair fine cracks in the glaze. This treatment is then coated with a topcoat to bind the glaze to prevent further crazing. Custom colored materials are made to recoat faded or failed terra cotta glazes. Techniques vary based upon the original construction of the units and building structure. Marion works closely with the terra cotta manufacturer to insure a successful fabrication and installation. 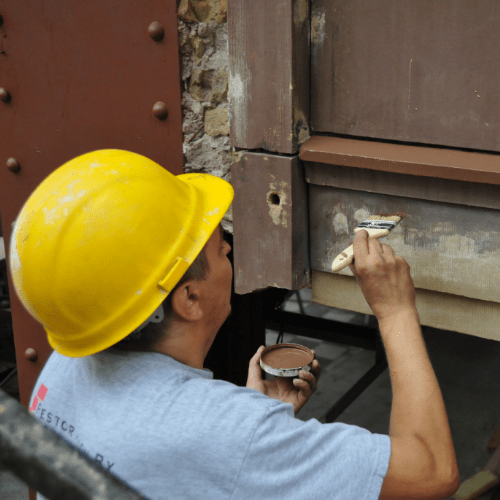 Marion repointing work is executed in accordance with the National Park Service, Technical Preservation Service’s Preservation Brief #7, “The Preservation of Historic Glazed Terra-Cotta” by de Teel Patterson Tiller. Marion works in partnership with our sister company U.S. Heritage Group, Inc. to develop custom patch material and coating.